We would like to notify Members of an updated ‘diversion expenses claim form’ to enable swift settlement of claims when a vessel has had to deviate to land, for example, for an injured or sick crew member or to obtain medical assistance. Below we highlight the different scenarios for making a claim and provide a consolidated deviation claim form to provide clarity to our Members as to the information and documents required to make a deviation claim with us. 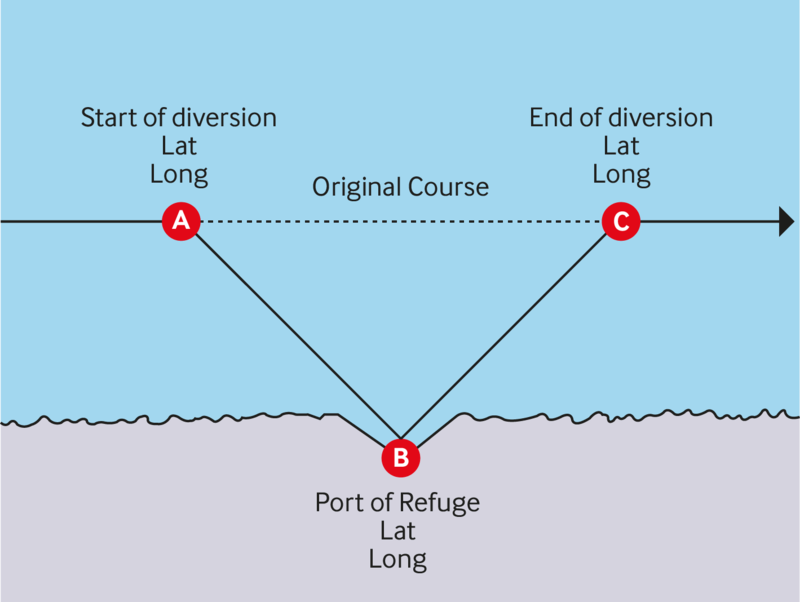 Vessels that have to deviate to land are entitled to claim the cost of any additional fuel and lubricating oil based upon the extra distance covered (Figure 1). 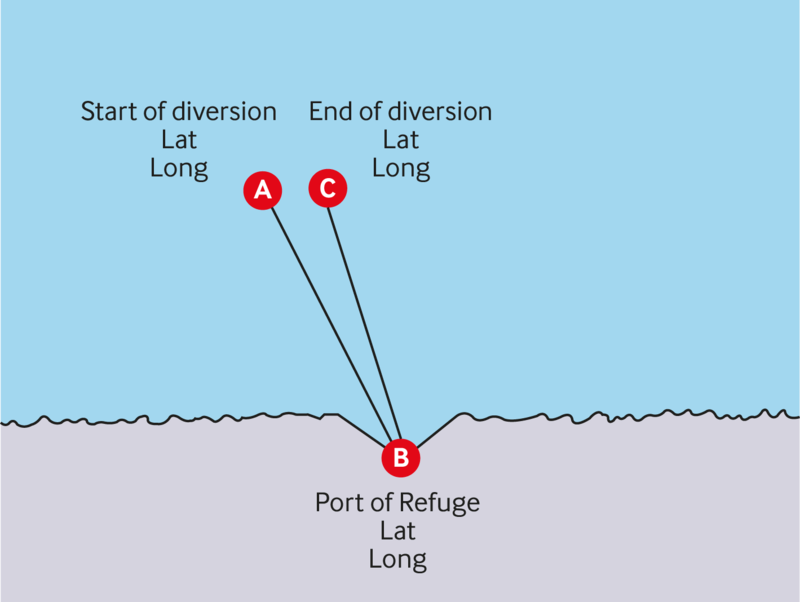 The extra distance is equal to the distance from the start of the diversion (point A) to the port of refuge (point B), plus the distance from the port of refuge (point B) to the point the vessel rejoins her original track (point C) less the distance she would have steamed if she had not diverted, point A to point C. This results in the formula: Extra Distance = (AB + BC) – AC. 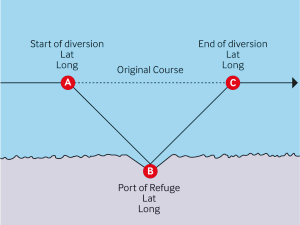 Vessels involved in operations such as fishing, offshore supply and standby, that have to deviate to land and then return back to the original location, are also entitled to claim the cost of all fuel and lubricating oil consumed during the diversion based on the distance covered. 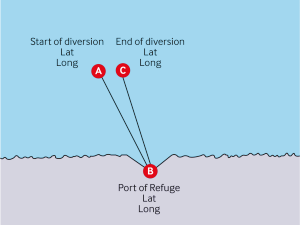 Therefore in Figure 2 the distance taken into account is equal to the distance from the start of the diversion (point A) to the port of refuge (point B) plus the distance from the port of refuge (point B) to where the vessel returns to her original position and resumes work (point C). No deduction is made for distances between points A and C if they are negligible. This results in the formula: Extra Distance = AB + BC. For both deviation scenarios, a diversion expenses claim form must be completed with relevant supporting documents as highlighted on the form. Click here to download the diversion expenses claim form.